If you’re both overcome and angered by the atrocities of our time, this will inspire a “new generation of activists and ordinary people who search for hope in the darkness” (Keeanga-Yamahtta Taylor). Is change possible? Where will it come from? Can we actually make a difference? How do we remain hopeful? Howard Zinn—activist, historian, and author of A People’s History of the United States—was a participant in and chronicler of some of the landmark struggles for racial and economic justice in US history. 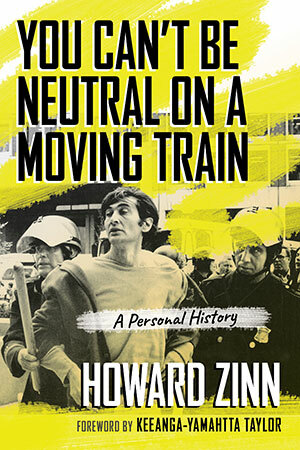 In his memoir, You Can’t Be Neutral on a Moving Train, Zinn reflects on more than thirty years of fighting for social change, from his teenage years as a laborer in Brooklyn to teaching at Spelman College, where he emerged in the civil rights movement as a powerful voice for justice. A former bombardier in World War II, he later became an outspoken antiwar activist, spirited protestor, and champion of civil disobedience. Throughout his life, Zinn was unwavering in his belief that “small acts, when multiplied by millions of people, can transform the world.” With a foreword from activist and scholar Keeanga-Yamahtta Taylor, this revised edition will inspire a new generation of readers to believe that change is possible.